Information: Branch lines were an important part of railway commerce in the early 20th century feeding passengers and goods from rural communities to the mainline services of the constituent companies. Operating costs were always a concern to accountants and as such economic solutions were of great importance. The Great Western Railway (GWR) answer to passenger service needs were small but versatile 14xx class that was a continuing development of earlier designs. Details: A total of 75 14xx 0-4-2T tank locomotives were built for light passenger and mixed traffic working on the numerous branch lines operated by the GWR. The locomotives were built at Swindon Locomotive Works in three batches between 1932 and 1936. Designed under the direction of Charles Collett, the locomotives shared much in common with previous two cylinder designs dating back to the George Armstrong 517 class of 1868. The chief differences between the Collett design and earlier siblings was the inclusion of a Belpaire firebox and cab layout. Originally classified as 48xx the entire class was renumbered after the war in 14xx series, as GWR wanted the 48xx series to denote modified Churchward 2-8-0 heavy freight locomotives converted to oil burning. 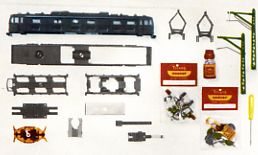 The 14xx was designed for push-pull operation with the ubiquous GWR autocoaches. This arrangement eliminated the need to run around the train at terminus stations for return workings. Later British Railways designated the class 1P motive power. As passenger locomotives both the GWR and later British Railways maintained the locomotives in various green liveries. As automobiles became common-place household items after the war, branch line traffic declined rapidly, resulting in closure of less profitable lines. By the late 1950’s and early 1960’s the locomotives were no longer of value to British Railways and were subsequently withdrawn. This was a period of slow decline with the last locomotives not being withdrawn until 1965 thereby allowing sufficient time and interest to ensure preservation of four locomotives.